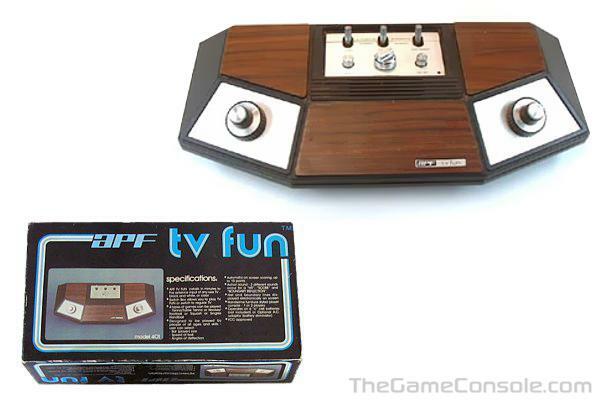 The APF TV Fun is a series of early Pong clone consoles manufactured by APF Electronics Inc. and built in Japan starting in 1976. The systems were among the first built on the General Instruments 'Pong on a chip', the AY-3-8500, that allowed many manufacturers to compete against the Atari home pong. The model 401 and 401a features four built in games, a built in speaker, and two controller knobs, Toggle Switches (choices are "Professional" and "Amateur") for the following settings - Angle / Bat Size / Ball Speed. There are 2 buttons - Power and Start Game, and a dial to select between the four built-in games. The TV Fun package is the first excursion of APF into the video game market, APF was formerly a calculator and other small electronics developer. It was sold at Sears under the name Hockey Jockari. TV Fun was followed up by the 8 bit MP 1000 and then APF Imagination Machine beginning in 1979. These were made to compete in the 2nd generation of early ROM cartridge consoles, namely the Atari VCS.